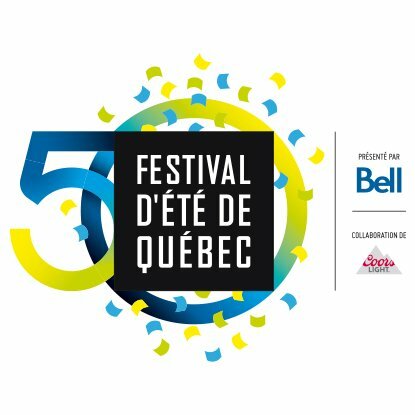 Festival d’été de Québec is pleased to announce the first 50 acts performing at the 50th edition, coinciding with Canada’s 150th anniversary. Once again the Festival welcomes a wide range of talent including local and national headliners, emerging artists and internationally acclaimed acts over 11 days, all for the modest price of $95 CAD until June 6. Festival d'été takes place at the world heritage UNESCO site of Québec City, from July 6 – 16. Seven time Grammy Award winner and prolific rapper Kendrick Lamar, high-flying pop sensation P!NK, double platinum 2017 Grammy award winning Australian producer Flume, 10-time American Country Music award winners and multi-platinum trio Lady Antebellum, boy band pioneers Backstreet Boys, viral chart-toppers Migos and two-time Grammy nominee and VH1 reality star Fetty Wap featuring Monty join previously announced headliners Muse and Metallica as part of this year’s Festival. For full list of the first 50 acts, please see below. -50 Summers of FEQ, an exhibition presenting photos, news articles, posters, and other mementos culled and curated from the archives of the past 49 Festivals. The collection will be on view to the public at the Parc de l’Amérique-Française from late June through the end of July. -At Parc de l’Amérique-Française, L’orchestre d’homme-orchestres, which creates musical instruments from everyday objects, will delight audiences every night before the Festival concerts with music performed on a wild assemblage of recycled materials by its forty-plus members. The show salutes Canada 150, which coincides with the 50th Anniversary of Festival d’été de Québec. -The French street theatre troupe Plasticiens Volants have created a show especially for the Festival’s 50th Anniversary, with their stunning and impressive large installations. Part puppet, part kite, its magical, colossal characters will float overhead and mingle with the crowd in an original dramatic and musical production. The mobile street performances begin around 11 PM, and travel from the Grande-Allée--—one of Québec’s main thoroughfares-- to the Coeur du FEQ, the Festival’s central rendezvous, for a grand finale, July 7 – 9. -The Transe Express troupe of street performers has cooked up a collection of trapeze artists, violinists, and an opera singer for a stunningly inventive show combining theater, acrobatics, and music, all performed while suspended from a giant mobile. The production’s soundtrack, Lâcher de Violons, is composed of memorable musical moments from the Festival’s history. These overhead performances will start around 11 PM at the Grande-Allée and end at Coeur du FEQ from July 13 – 15. 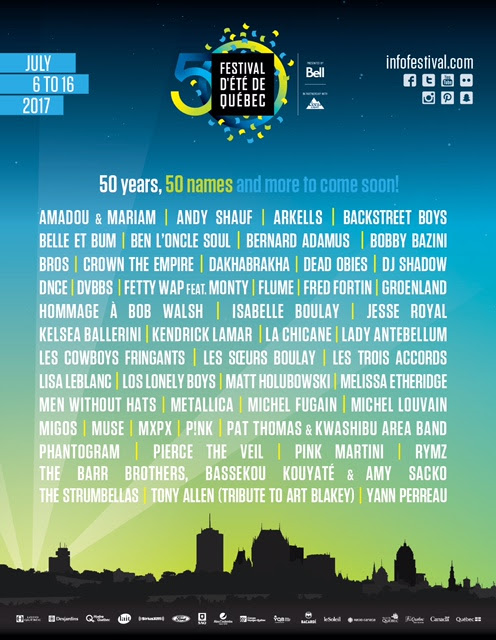 Festival d’été de Québec, Canada’s most important outdoor music festival, is set in modern, yet historic and picturesque Québec City. With global attendance usually topping more than one million entries each season, the Festival celebrates music for 11 days in July at 10 indoor and outdoor venues. It offers the perfect setting to discover up-and-coming artists and enjoy world-renowned stars. Over the past few years, the Festival has presented artists including The Rolling Stones, Lady Gaga, Bon Jovi, Sting & Peter Gabriel, Sheryl Crow, Duran Duran, Selena Gomez, Red Hot Chili Peppers, Foo Fighters, The Killers, Snoop Dogg, Keith Urban, Aerosmith, Skrillex, Lionel Richie, The Offspring, Metallica, Elton John, The Black Eyed Peas, Billy Joel, Iron Maiden, Plácido Domingo, Sting, Charles Aznavour, Megadeth and KISS. Every year, more than 1,000 artists and close to 300 events, from rock to pop and French song, hip-hop, electro, blues and world music are showcased. Festival d’été de Québec also features FREE entertainment with numerous street performers, and outdoor activities for children. The Festival is easily accessible and affordable for American and international travelers.